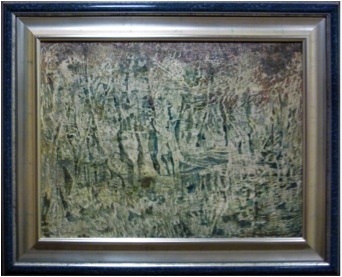 This work was shown at RESAMPLE, curated by Stephanus Erasmus. This exhibition paired a selection of works from the ABSA Collection with practicing artists, who were asked to produce companion works. Werner’s Green’s arose from a pairing with Georgina Ormison whose work is concerned with colour, texture and natural landscapes. This particular Petrified Forest, evokes the fossilised remains of a landscape – wood turned into stone. Darwin’s theory of evolution was contingent on evidence of the age of the earth, provided by fossils and geology. On his Beagle voyage Darwin’s first entry of 1833 reads: “many glaciers beryl blue most beautiful contrasted with snow.” This colour reference is taken from a book that he had in his possession, mineralogist and geologist Abraham Werner’s Nomenclature of Colours, 1774. Born in the year if its publication, Edinburgh flower painter, Patrick Syme revised the book in 1821. 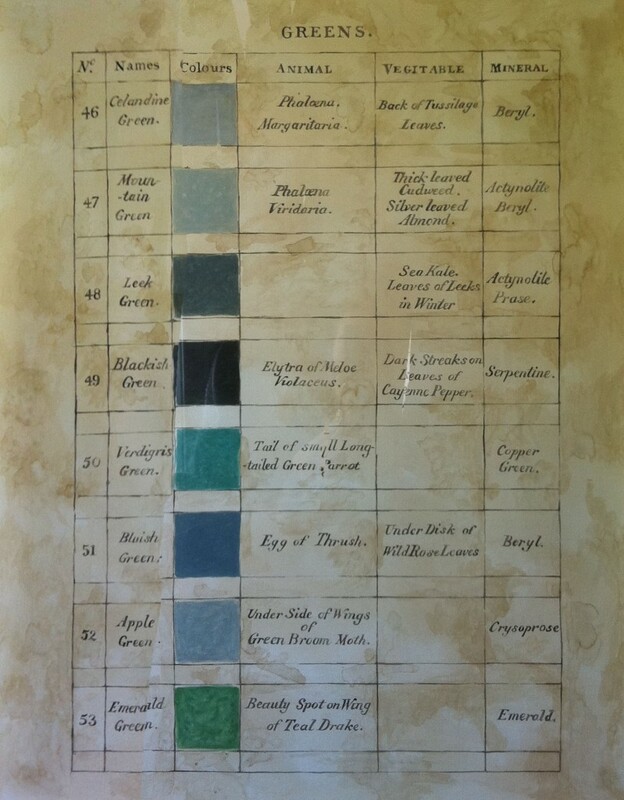 Werner’s intention was to create a system for the classification of colour to describe and classify all characteristics of rocks and minerals dug out of the earth. 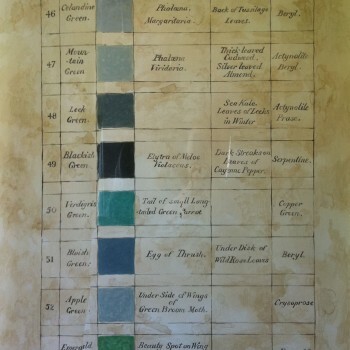 Syme added other natural phenomena to this classification and the book was to have a major impact on the organisation of colour in the nineteenth century, assuring that all naturalists were describing the world using consistent terminology. The intention of this work was to bring together a thematic concern (geology/ fossil) with a particular history of colour. Syme’s and Werner’s book is hard to access and no good reproductions exist on the internet. The intention was to render the page on green meticulously in watercolour – as Symes would have done. Set in relation to Ormison’s work, it alludes to systems of reference and the way in which the landscape is codified and ordered. Whereas Ormison’s work is suggestive, the Werner page implies a specificity in nature. ABSA Gallery, Johannesburg. October 2012 – February 2013.